IRELAND was a brilliant place to be a music loving teenager in the late 1980s and early 1990s. Not only could we get into the Liverpool, Manchester and indie scenes in Britain but we also had a remarkably prosperous and vibrant home scene. One of the few benefits of the opposing effects of Troubles (North)/ crushing recession (all over) and the global rise of U2 was a slew of bands worth listening to and following. In the wave which came after the likes of Les Enfants, Cactus World News and Blue in Heaven, we had The Four of Us, Hothouse Flowers, An Emotional Fish, The Fat Lady Sings, and Hinterland among others. Each played widely varying versions of Irish indie, a world away from the Celtic bombast many were accused of. Looking back on it Something Happens were the best of the lot. Based around the songwriting talents of singer Tom Dunne and guitarist Ray Harman with Eamon Ryan on drums and Alan Byrne on bass, they produced some of the most memorable songs of the era. 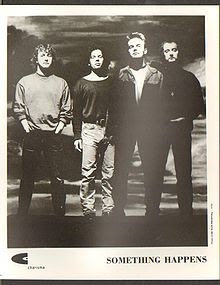 Their first album Been There, Seen That, Done That had two great tracks, 'Beach' and 'Forget Georgia', the latter of which was an oblique tribute to REM. That link is appropriate, in so far as, the Happens managed to mould the twin influences of Michael Stipe's crowd with The Pixies, both bands were amazingly popular among Irish indie fans (along with The Smiths and almost ubiquitous The Cure). Their second album, Stuck Together with God's Glue, was by far the best of the three they recorded. Produced by Crowded House, Los Lobos and Richard Thompson mentor Mitchell Froom, it managed to bring to their indie sensibilities in line with Froom's trademark quirky keyboard sound. The Happens live show was immense and when I saw them on three occasions they were the best of a very good crowd of bands. Only An Emotional Fish came close as a live act. Dunne was a great singer while the real star was Harman on guitar, a gifted, unique player who utilised open tunings and great effects. (Witness the great That Petrol Emotion inspired riff on 'Hello, Hello, Hello, Hello, Hello (Petrol)'. They also did a fine line in quirky covers including a daft hard rock guitar cover of large chested Italian model Sabrina's Euro pop hit 'Boys, Boys, Boys (Summertime Love)' on the B side of the 12" of 'Hello'. After they were dropped by the Virgin label they recorded one more album Bedlam a Go Go!. It was however a wee touch too commercial and too close to the poppier elements of Celtic rock, in my opinion. Two years later they split. Dunne has a high profile radio DJ gig now while Harman, having been the composer in residence at an Irish music museum, now works in TV. I have to say that of all the albums of that time, Stuck Together... is one of the few I play regularly and which has aged tremendously well. The only problem is: It can't be 21 years ago since I saw them do Beach for the first time. Surely.